You recognise a structured, periodised training plan is vital to becoming the best fighter you can in the long-term, and to peak for your next fight in the short-term too. But you’re unsure what should go where in your plan or for how many weeks. You’re worried that your opponent has help to sort this all out and is doing a better job of it than you. As a strength and conditioning coach for Thai boxers, I plan and manage training programs for multiple fighters at the same time. And change is (frustratingly) inevitable. Fight dates move, holidays, illness or injuries happen. To cope with this I developed an automated excel spreadsheet tool to keep track of fight dates and plan persiodised training blocks for best effect. 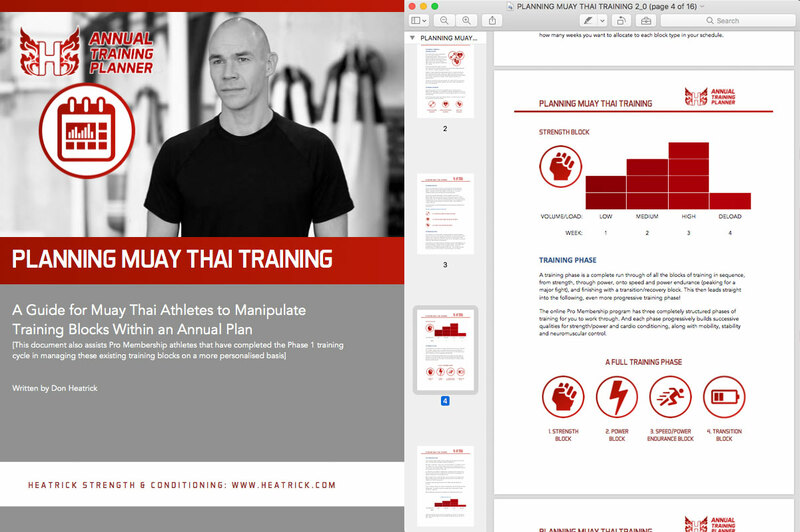 You’ll not only be guided through how to use this fantastic spreadsheet tool, but will learn how to best plan your training blocks for great long–term progress and shorter-term fight peaking with a Planning Muay Thai Training guide. If you can honestly say you’ve revised the Planning Training Guide and applied the principles to your training using the spreadsheet tool and not improved your fight preparation as a result, we will refund your entire package investment. You’ll confidently plan your training for your next fight and beyond, and easily adjust training when circumstances change and maximise your athletic performance. Or accept you’ll either give up on planning training altogether or make programming mistakes that will cost you your best fight performance on the day, or critically your year on year progress – letting better-prepared opponents leave you further behind. No longer become frustrated with training lacking structured direction and versatility. Instead confidently and capably prepare for each fight, and react effectively to any changes thrown at your schedule… starting today! “I just went over the Excel spreadsheet for annual planning. What a great tool? You’ve really simplified the planning process. DO I NEED MICROSOFT EXCEL? Yes, you’ll need Excel 2011 or later for all the spreadsheet functionality to work. DO I NEED TO KNOW HOW TO PROGRAM TRAINING SESSIONS? Yes, you’ll need to know how to put together training sessions. This is a tool for planning your annual training, not for programming individual training sessions themselves. You’ll be guided as to which type of training block (mesocycle) to use (strength/power/speed), the number of weeks and the training intensity, but exactly how you put your sessions together is up to you. CAN I USE THE ANNUAL PLANNER MORE THAN ONCE? Absolutely. 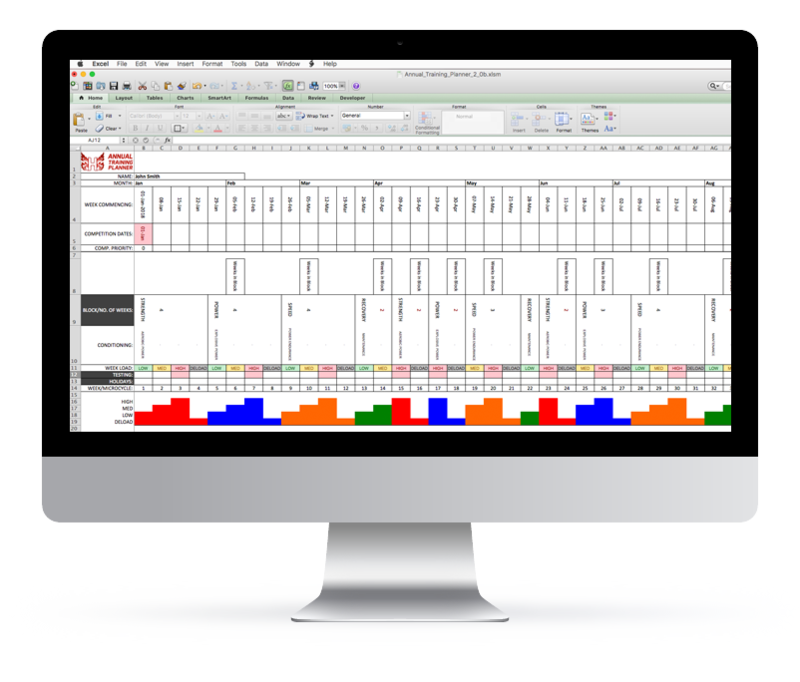 You download the Annual Planner Excel spreadsheet and can re-use it as often as you like. The dates in the plan update based on the dates you enter, and you can also enter different athlete names too. As soon as you order, you’ll get instant access to the Annual Planner module complete with all the support material in the your online coaching portal. No hanging around. Get straight on it.